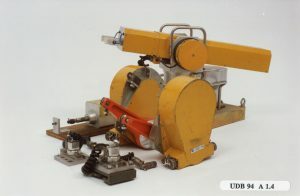 The Universal Dynamo meter Bench (UDB) was a vehicle test bench of the Material Testing Department II of the Royal Netherlands Army in Huybergen. In its original design from the sixties, this test bench consisted of three pairs of machines (measuring axes) between which the vehicle to be tested was placed on benches. The wheels of the motorised axles were removed. 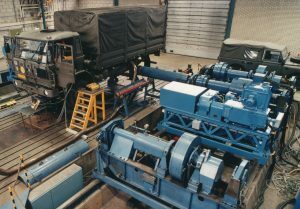 The counter sides of these axles were coupled to the electrical machines aside of the vehicle using connecting shafts. A driver operated the vehicle under test according to a scripted protocol. The load on the vehicle was determined by controlling the electrical field of the connected electrical machines. Of the three measuring axes, one was coupled to a direct current motor-generator (E-axis). This allowed braking of the vehicle during a simulated trip on the flat road or upward slope or to be driven at a simulated downhill ride. With the aid of a driving simulator, the handling of the vehicle could be simulated. The driver could accelerate from a standstill, stick-shift gears, and so on as if he was driving on a normal road. The energy supplied or absorbed by the vehicle was delivered to, respectively taken from the power mains. 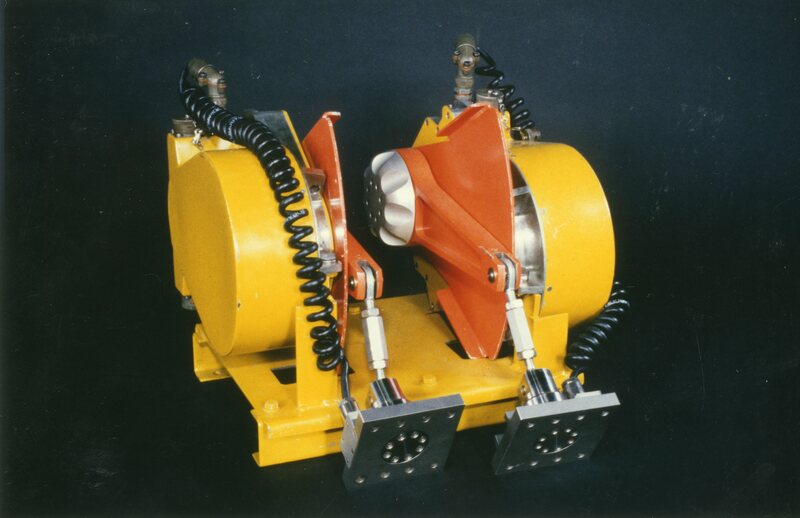 The other two machine pairs were equipped with eddy current brakes (W brakes). These slowed down the vehicle. The energy produced by the vehicle was converted into heat in the W-brake and discharged via a cooling water circuit, which, when necessary, was coupled to a cooling tower. The installation was intended for testing the powertrain of a vehicle. Vehicles under test could be anything from a military jeep to a Leopard tank. 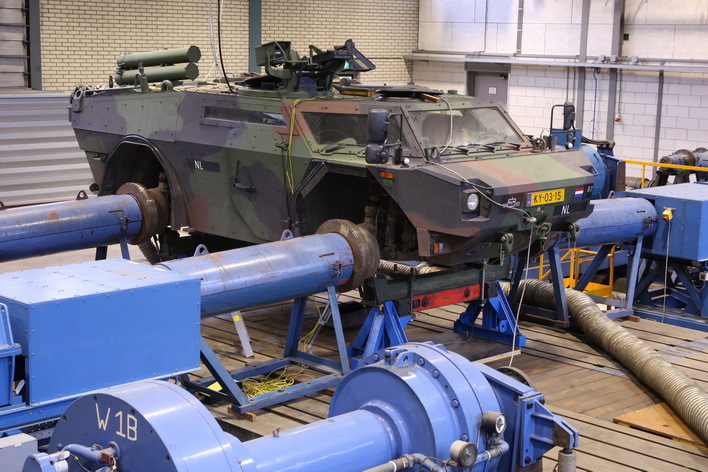 The main objective of these tests was to stress test a prototype of a series of vehicles to be purchased by the Royal Netherlands Army. The installation was also used to investigate the cause of recurring vehicle failures during operations. 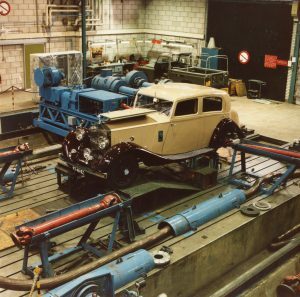 Acceleration of light vehicles at the on the bench was very difficult due to the large mass of the measuring machines coupled to the axles. Sometimes the gear plates had already been burned before the vehicle had taken off. The often lengthy test drives on the bench were very mind-numbing for the driver; this benefited neither his driving nor the final test results. In addition to torques and speeds that were measured with the measuring axes, other measurements were required such as temperatures, pressures, electrical voltages and currents. Measuring these required technical solutions on an ad hoc basis; a time-consuming, but repetitive activity. 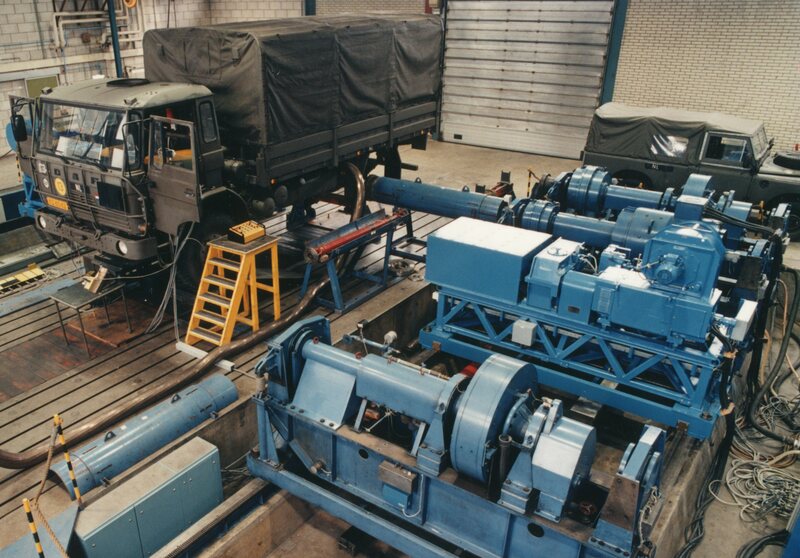 There was an increasing need for the dynamic testing of multi-axle-driven vehicles. This required a second E-axis to be linked to the already existing axle. To estimate the life expectancy of the vehicle, it was important that the vehicle could be subjected to a repeating load pattern to determine the vehicle’s lifespan. After a large number of discussions, a set of requirements was drawn up, technical solutions were presented, and choices made were recorded in a Project Definition Document (PDD) at the beginning of 1983. This included the planning, the material costs and the project organisation. After then PDD was studied, commented, and approved by the Royal Netherlands Army, the LEOK started the UDB renewal project in 1984. In addition to LEOK developments, LEOK explored the market to find a suitable industry for improving the E-axis. Holec was selected. Holec replaced the control of the E-axis, in fact, a huge rotating magnetic amplifier, with a much faster Thyristor anchor control. In addition, the design of the driving simulator was adapted in such a way that light vehicles could also be tested without the burning their gear plates. 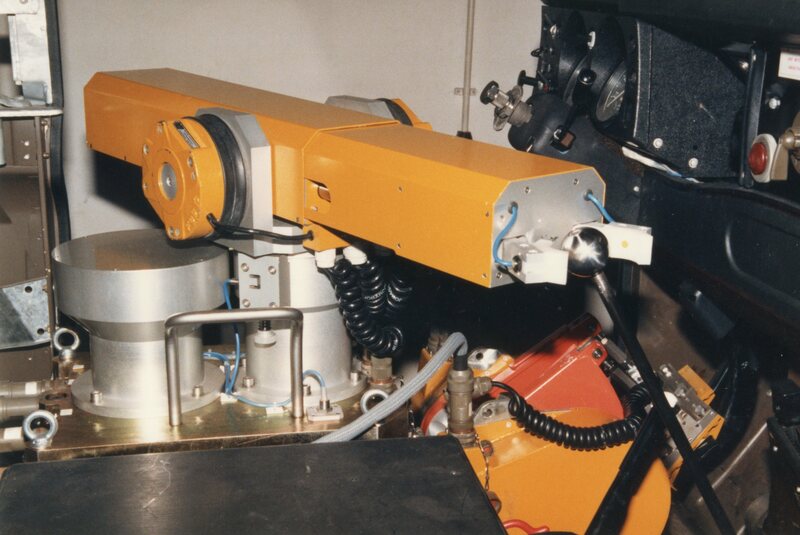 At a later stage of the project, the second E-axis was ordered from Holec. 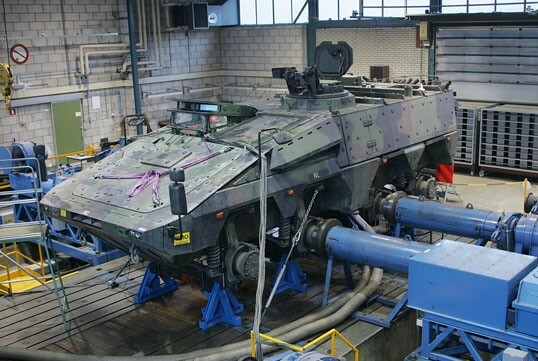 Using the two E-axes, the Royal Netherlands Army could dynamically test four-wheel-drive vehicles. The LEOK developed a robot to replace the driver. At that time, there was no system on the market that was small enough to fit in a vehicle cabin and that was also strong enough to operate all types of vehicles. The LEOK was therefore forced to solve this problem in-house. Using expensive so-called ‘Direct drive’ engines: small, slow-running engines, but strong engines due to the use of very strong samarium-cobalt permanent field magnets, caused LEOK to be successful to meet the requirements. The end result was a compactly built switching actuator which was mounted on the foundation of the driver’s seat (see photo) and had separate actuators for operating the pedals. This component, surrounded by the necessary electronics and not to mention software, was able to operate wheeled and crawler vehicles, with a petrol or diesel engine, and regardless of the type of gearbox, automatic or manual (up to at least eight gears), synchronised or not synchronised. A data collection system was developed to simplify the preparation of measurements, and the registration and processing of measurement data for the user. As discussed above, many tests of the vehicle required the monitoring of many test points. In order to quickly and efficiently implement such a measurement plan without messing up the workplace with a large set of tangled wires, eight connector boxes were developed, each with the possibility of connecting up to eight sensors. For example, there were measuring boxes for temperature measurements, pressure measurements, and measurements of electrical quantities. Such a measuring box could be placed near or in the vehicle. The box was, therefore, a collection point for the measuring sensors to be connected. The measuring boxes were connected via a channel under the floor to a central connection box. The measurement data from the measuring boxes but also the measurement data of, for example, the measuring axes, the weather station and the exhaust gas analysis were sampled under the control of a microprocessor. Rapidly varying signals were sampled more often than slowly varying signals. Approximately 1,500 samples could be taken per second. This measurement data could be recorded, edited up to, for example, a torque-rate graph and presented on PC screens. Special test equipment was developed at the end of 1984 to determine the load on the microprocessor’s direct memory access (DMA) by the robot. 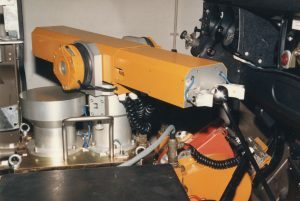 Both the robot and the data collection system were controlled by their own microprocessor, which in turn was controlled by a central microVax II. Of course, the introduction of all these new computer systems had far-reaching consequences for the operation of the installation. A complete renovation of the control room and the control systems installed therein was needed. 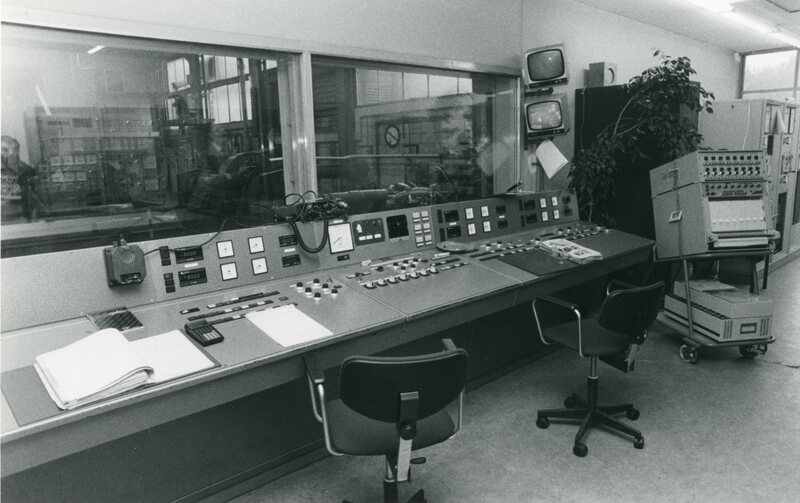 In collaboration with the then TNO Institute for human factors (IZF), a new main control console was designed. 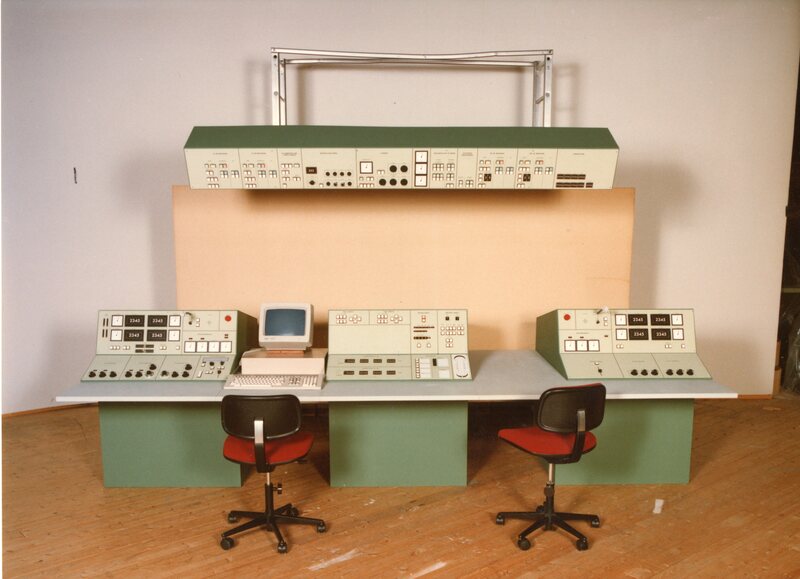 IZF supplied a full-size wooden mock-up which allowed the human factor testing of three alternative configurations of the control panels. After evaluating the pros and cons, fully detailed construction drawings of the final control console design were made. The physical construction of the cabinet was outsourced. 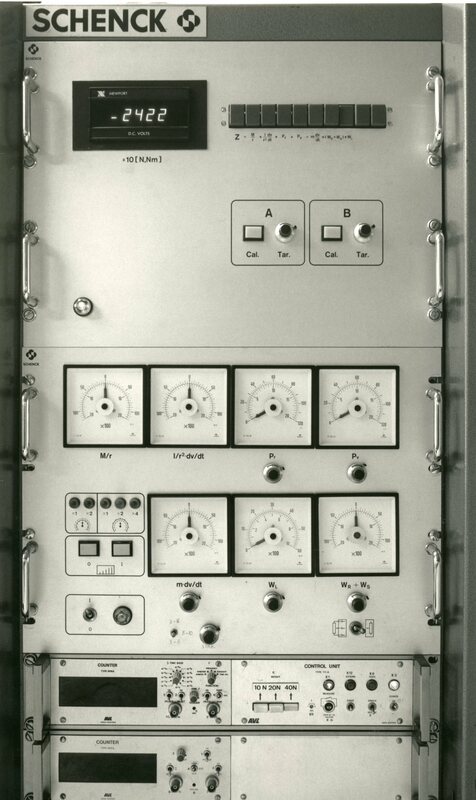 TNO-FEL, in which the LEOK had already been merged, developed the mechanical and electrical parts of the main console. The main control console was then installed in the UDB control room in front of the window overlooking the test hall. An intercom system and a double video system with remote cameras controlled from this main control console provided the contact with staff and equipment in the hall. The picture above gives an impression of this console. Striking in the picture are the two PCs that communicated with the aforementioned microVax. Those PCs processed all software developed by TNO-FEL in the Microsoft Windows environment. 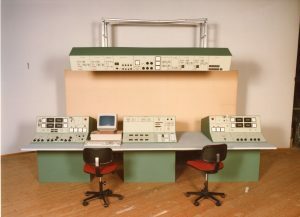 In addition, a computer language developed by TNO in MicroPower/Pascal on the MicroVAX compiled ‘scripts’ that described and controlled the test of a vehicle. That setup made it possible to run tests fully automatically; a valuable tool for, for example, endurance tests. Bovenstaande foto geeft een indruk van dit console. Opvallend op de foto zijn de beide PC’s welke communiceren met eerder genoemde microVax. Met die PC’s kon alle door TNO Waalsdorp ontwikkelde software vanuit een Windows omgeving worden bediend. Daarbij behoorde ook een door TNO ontwikkelde computertaal geschreven in MicroPower/Pascal waarmee een ‘script’ kon worden samengesteld dat de uit te voeren proef tot in detail beschreef en bestuurde. Dit maakte het mogelijk een beproeving volledig automatisch te laten verlopen; een waardevol hulpmiddel voor bijvoorbeeld de uitvoering van levensduurbeproevingen. During the system integration phase, the dynamometer, the computers and ‘robots’ were built, installed and connected at the TNO location Oegstgeest. The final delivery to the Army was foreseen to occur in 1989. The installation of a second E-axis made it necessary to increase the capacity of the main transformer of the installation from 1000 KVA to 1600 KVA. It was no surprise that the new transformer no longer fitted in the old housing; so a larger transformer house had to be constructed. The introduction of Thyristor-anchor controls for the E-axis made the Ward-Leonard control of this axle obsolete. The very outdated relay cabinets of the supporting systems could be disposed of. The supporting systems comprised the machine park to cool and lubricate the measuring axles in the hall, to exhaust the exhaust gases, and to provide a flow of air towards the vehicle. 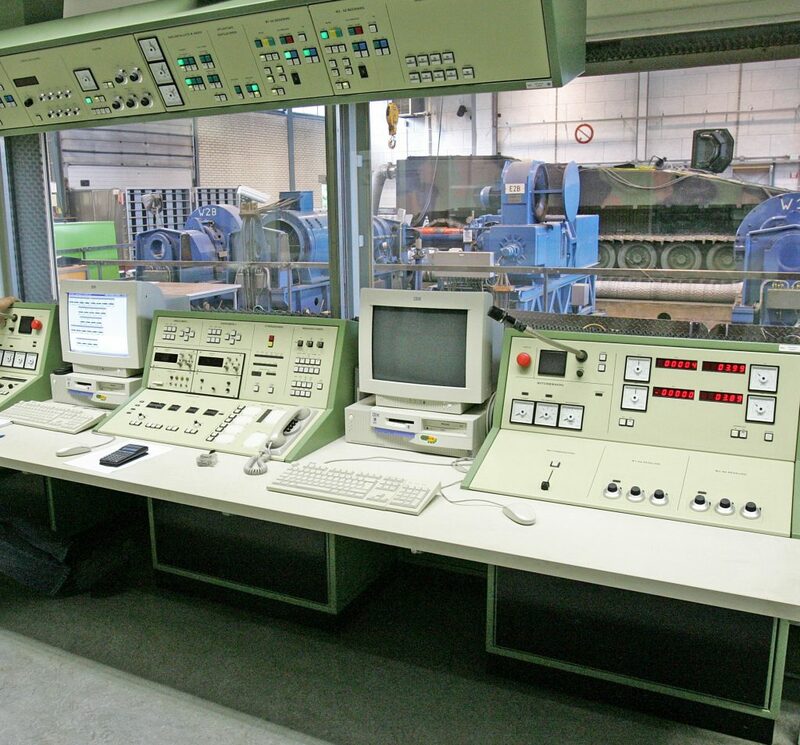 The emptied space was rebuilt on instructions from TNO and Holec and used to install the power electronics of the measuring axes and the new control cabinets for the support systems. Holec delivered these systems; the design was by TNO. The illumination installation of the UDB test hall was completely renewed according to an IZF recommendation. Special attention went to the cleaning of the lamps that quickly fouled by burnt fuels. 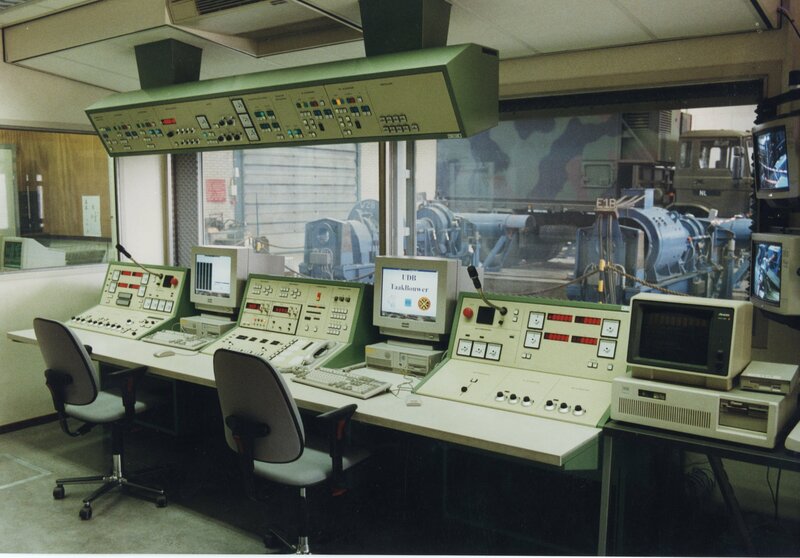 Based on IZF-advice, the control room was equipped with new lighting, air conditioning, and sound insulation. The test hall was acoustically separated from the remainder of the building by using a sound-proof lock. Main operating console UDB with DAF YA4440, a 4-ton truck with removable hood and with single ‘air’ brakes behind, on the test bench. In November 1991, the UDB project was successfully completed with a demonstration. In addition, a 10-tons truck using 4-drive mode with a switched eight-speed gearbox was fully numerically controlled for a number of hours. The pictures below show the DAF YA44400/4442 vehicles under test. UDB with DAF YA4442 under test (4-tons truck with a fixed container to be used as workshop, command control unit, etc. The container was also available with different windows in the walls for more daylight).